The Order of the Golden Circle is the women’s auxiliary of the United Supreme Council, 33°, Ancient & Accepted Scottish Rite of Freemasonry, Prince Hall Affiliation, Southern Jurisdiction, USA, Inc. 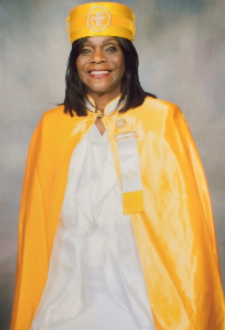 While the organization serves as a quasi-social organization and outlet for the mothers, wives, widows, daughters and sisters, it is essentially the community service oriented sisterhood of the United Supreme Council, 33°, Ancient & Accepted Scottish Rite of Freemasonry, Prince Hall Affiliation, Southern Jurisdiction, USA, Inc. The symbol of the Dove within the golden circle signifies the hope that peace shall reign always within our precincts; the Circle, endless union we shall have. A guiding hand for all the way; May our hearts be ever lifted upward; may our Golden Circle be endless as the circle by which it is represented, may peace and unity abide with us forever more!